It has been revealed that Yamashita Tomohisa will be making his international debut! American actor and rapper Jaden Smith will serve as his creative director. The Japanese Micheal Jackson and Smith recently crossed paths at the 26th Tokyo Girls Collection 2018 Spring/Summer runway show, which had media and fans buzzing. 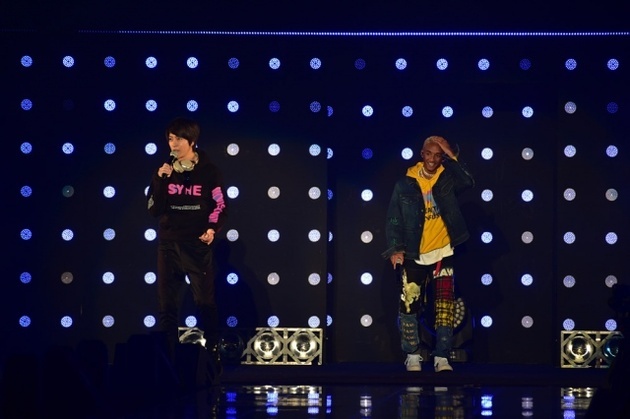 Yamapi appeared as an unannounced special guest. He sashayed down the runway wearing a hood, with the audience erupting into cheers when he finally revealed his identity. He showed off his perfect fluency in English by introducing Smith to the excited crowd. Prior to the event, the two were spotted shopping in Harajuku, no doubt conjuring up looks and inspiration for Yamapi on the world stage. Shortly after Johnny & Associates sent out a fax announcing Yamapi’s advancement overseas. The Daite Senorita hitmaker will not only release music, but dabble in acting as well. Smith was selected as Yamapi’s “creative director” due to his philosophical mind, and unique style. The two instantly bonded upon meeting and already have multiple projects planned. Furthermore, now that Johnny is on the cutting edge of technology and is more accepting of the internet they have hired the worlds top social media gurus to help make the international transition more smoother. Rather than having an official Twitter, Facebook, YouTube, or Instagram account Yamapi’s team has opted for an official LiveJournal account instead. It’s launch date is expected to be announced shortly. In a statement Smith revealed that he’s always been a huge fan of Yamapi, and has been following him since the beginning of his boyband days. “I used to love KAT-TUN, they rock”. Smith promised that fans won’t be disappointed, and is confident Yamapi will be a huge star saying “WEEABOOS ARE THE FUTURE“. His debut international single will be a cover of Dolly Parton’s 1974 hit I Will Always Love You, due out in the summer of 2018. Yamapi’s version will incorporate elements of trap and EDM music. Click here to listen to a preview of the song.